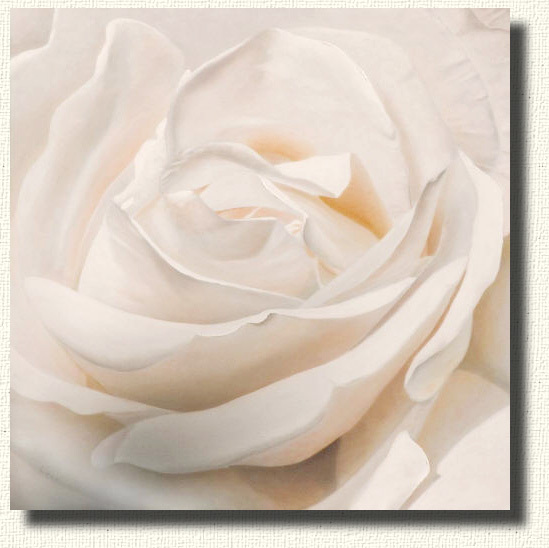 ...White roses have a wide appeal and a wide range of meanings to people. I start with the essence of the rose. But I am influenced by Renoir and his use of color in his portraits. As and example he will often use blues and violets to make the shadow areas of a face more intense in relationship to the lit areas which tend to be in warm tones. I had doubts about the idea until I experiments with his use of cool colors in shaded areas and found that he was right. The cool colors, even violets, make the lit areas even warmer. So...Renoir was right and my roses are better for his amazing contributions to portrait painting. After studying Renoir portraits I now consider most of my rose paintings to be portraits with the guidance of Renoir. 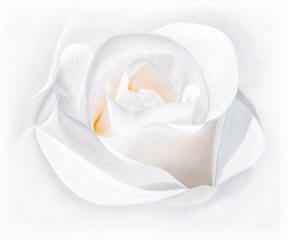 This is a view of a white rose from is what seems to be a universal form. This shape is found in galactic structures on a astronomical scale. This form is also seen in large earth structures like hurricanes, and in small structures like sea shells roses. This rose has a orange/yellow tone where others have a red or pink tint. I have learned how to apply very delicate hazes of tint in a rose such as this. Up close, the individual colors can be see as delicate dabs of paint and standing further back the paint is seen as simple color gradients - but it is more difficult than it looks! I wanted this rose to be its own universe. 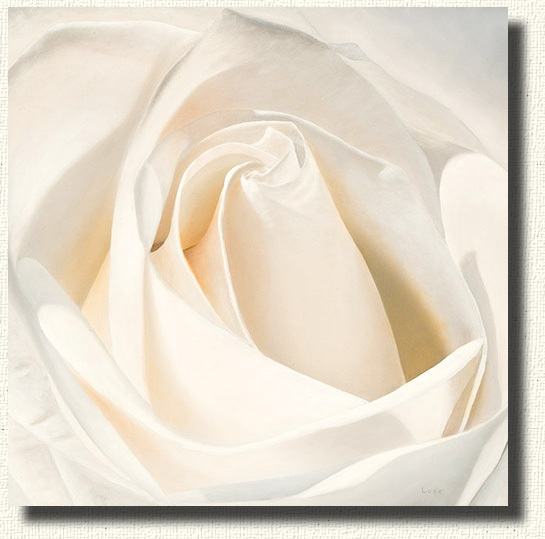 The blended edges make the rose infinite because the edges merge with the white of the canvas. 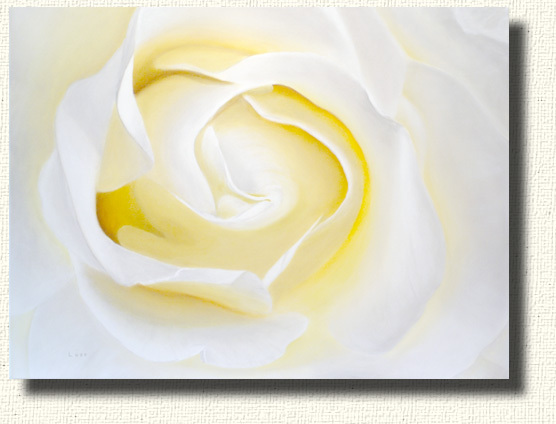 All white roses show a little of their heritage by showing some color in the heart of the rose. This color is best seen by moving the branch into full sunlight and looking into the center of the rose. There is always a touch of orange, yellow, or red in the center hinting at the ancestral colors. I like to blend extreme realism with the vagueness of the natural world. I am hoping to simply paint elaborate cloud formations one of these days just for the fun of connecting the realism of the clouds to the emptiness of water vapor that they really are. They are defined and undefined at the same time. I painted this just after seeing Renoir originals in Chicago. He had a profound effect on my use of color. There is a range of pure oranges, yellows, blues, and violets actually on the canvas. These are not diluted oils - they are mostly pure pigments applied directly to the canvas. Applying the paint is a complex and delicate process and easily destroyed with a single stroke of a brush. But the effects are well worth the risk. Honor is the name of this rose. It is one of the most beautiful white roses in our garden. This painting has a lot of meaning for a lot of different people. For me this is about the flowing beauty and fullness in nature. The description voluptuous seems right for this beauty. This is one of my favorite paintings. This painting went quickly and seemed to take on a life of it's own. Some paintings are more a matter of the painting revealing itself than paint being added to the canvas - this was just such a painting. 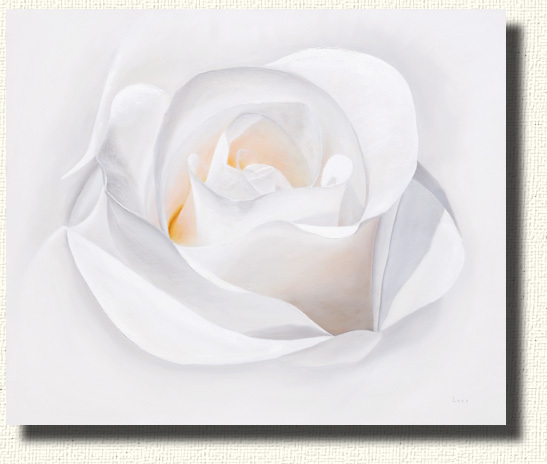 This painting is also more about the essence of a rose more than the botanical view. 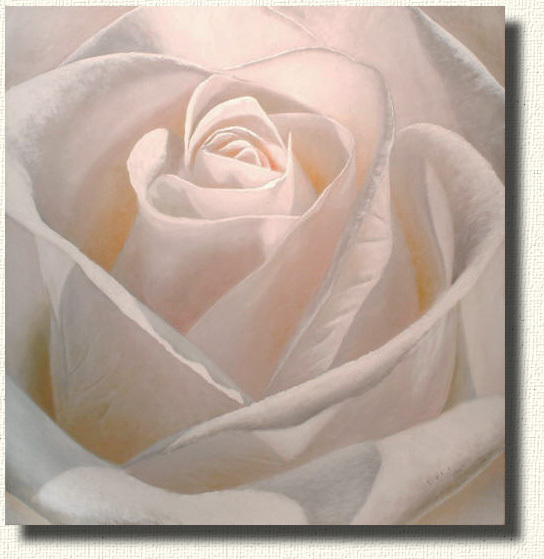 All of my rose painting are created with the help of extreme realism. The realism allows a viewer to move as closely as they please and still see deeper into the rose - back to the bee's eye view.